Designer Surfaces presents an approach to the design and fabrication of optical elements that are based on the use of one- or two-dimensional randomly rough surfaces to reflect or transmit light in specified ways. 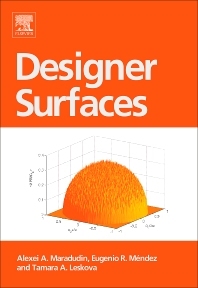 The reader is provided with an introduction to analytical methods for the solution of direct problems in rough surface scattering, and fabrication techniques. These can be useful in contexts outside the scope of this book. The advantages and disadvantages of this stochastic approach compared to the diffractive optics approach are discussed. Finally, experimental results that verify the predictions of the theories developed in this book are presented. Alexei Maradudin is a Research Professor of Physics at the University of California, Irvine. A condensed matter theorist, his research interests focus on phenomena occurring at surfaces and interfaces. These include studies of linear and nonlinear surface waves of various types, their propagation across rough surfaces, and their scattering by surface and subsurface defects; weak localization effects in the multiple scattering of light from, and its transmission through, randomly rough surfaces; inverse problems in rough surface scattering; and surface photonic crystals. He has published 400 articles devoted to these research areas.